Yes, I’m still alive. Yes, it’s been one of those weeks. Life can throw things at you left and right, good and bad. Tell me you relate? That you understand and get it too ? Somehow in the mix of life these past few days I’ve been distracted in my writing which bothers me ’cause writing really is an outlet for me. Yet there have just been times I’m hard pressed to connect two words together. But there are so many other things in life that make up who we are and so, I will have times that I will address those topics as well. Topics to write on abound and so I will continue to share my passions of health, fitness etc but also those things we all contend with at one time or another in our lives. 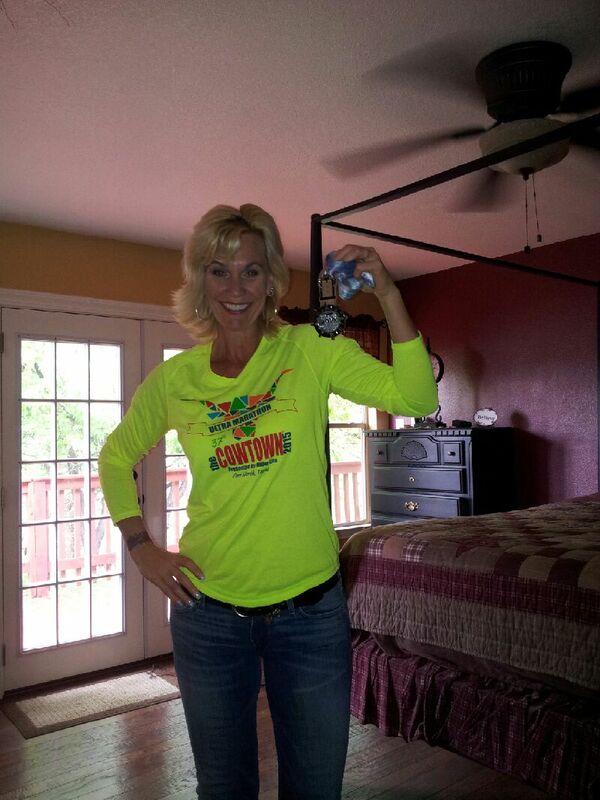 Now, on with the show…..
I’m stupid proud of this medal. It represents a ton of hard work and sacrifice, and I don’t mean just running the 50K distance either. 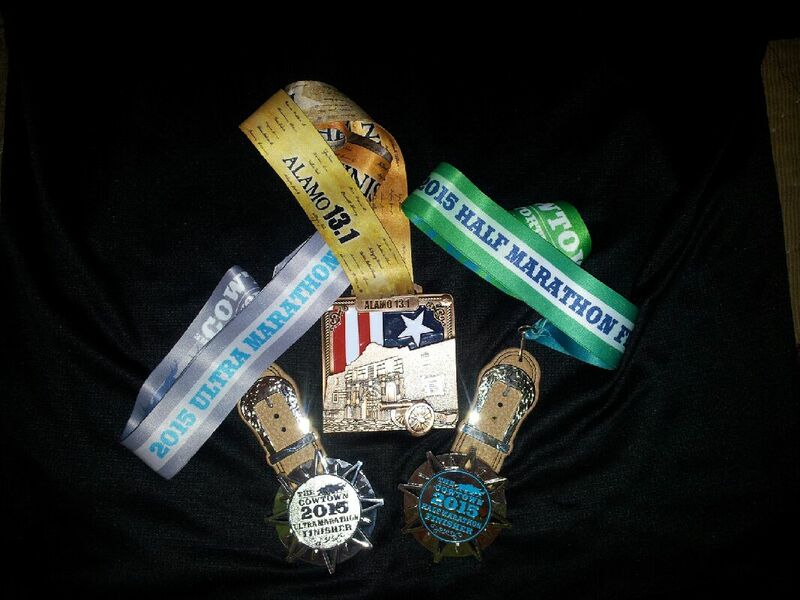 Also, March was my most productive racing month…..ever… since I started running… I got some cool runners bling to prove it too 😉 2 half marathons and the 50K…. Ugh, my mileage has reallllyyy come down and I hate it. I think I hate knowing I’ll have to rebuild to that all over again. In a smart way I also know and understand my body must have recovery time from such heavy mileage. I’ll be hitting my bike more, doing boxing and some more weights to strength train and a few days running for awhile. I do have a marathon goal for year end so I know I need to give myself some lower mileage before I ramp it up again in a few months. As I’ve mentioned before, I’ll never be the fastest out there or be the most impressive, but I hope to show that being older isn’t a reason to not be strong and physically fit. I hope to consistently encourage others to get out and do something, to find their “thing” and be good at it, to be empowered by what they can achieve and accomplish. Really? Is there anything better or more rewarding than setting a goal for yourself that seems huge and daunting, and then, doing it ?? Crushing it ? In other life news, things that kinda derailed me this week. My otherwise, seemingly healthy dog, turned sick and basically after an emergent trip into the vet on Sunday to see if she was having a reaction to some meds or if she was dehydrated, they informed me that she had liver and kidney failure and did I want to put her to sleep…. now ? To say I was shocked is putting it mildly. No, I couldn’t do it then… I couldn’t go back home with a dead dog and not give my kids a chance to say good bye… I needed that too.. but I also knew if I loved her I would need to act on it quickly. Her condition just rapidly got worse. Stella was a golden husky mix. At one point my sons dog, she came to stay with us till “he got settled somewhere else” the rest is history on that. In my early days of fitness when I walked, she came with me, as I started running, she easily kept up. She was never on a leash and loved running in and out of the hill country where I lived. She plowed up hills with me like it was nothing. Whatever she was mixed with, she was made for endurance. As I got stronger, and my mileage increased I worried about her going farther from home. I started to leave her. She cried and howled in the beginning. She didn’t want to be left. It was fitting at the end, it was just the two of us. I won’t lie. I loved that dog. She was quiet and laid back, lady like when she laid down with her paws crossed at the ankles. She had such thick, thick fur. It filled her ears which I loved to play with and pet. Watching her go was as much painful, as a blessing to know she wasn’t in pain anymore. Taking her home, burying her, I sobbed and petted those ears over and over trying to commit them to my memory… knowing I’d never stroke them again…or see her keen eyes watching me… or laugh at the way her tail always curled in a jaunting way over her back. I finally made myself leave her… pick up the shovel and finish the process. Even now two days later writing this, the grief is welling up in my heart. I looked for her this morning. I looked for her last night. I know better. But I miss her presence. I know from experience it will become less painful… less agonizing to think of…. right now it’s still raw… mainly I think… ’cause it came out of nowhere. So yeah, life. Stuff happens, good and bad. It’s where I’ve been this week. Moments of triumph cloaked in moments of agony and pain. I hope to be able to continue to chat with you about not only my passion for people to find their way to health and fitness, but also those other real life things that define and shape us. Have you had particular moments in life that you know have shaped and defined you more ?